Firstly I want to apologise to all my regular readers. As you may realise it is the summer holidays and normally I shut the blog down for a bit in order to spend time with my girls. For some strange reason I didn't shut it down this time and I feel bad, as I am struggling to read anyone else's blogs at the moment. Please bear with me, as soon as the kids go back in September I will have more time to stop by your blogs and comment. I have quite a few post lined up over the next few weeks, but I doubt I will be around personally. I want to thank you all for your ongoing support of the blog. Many of you know I have been writing and I did finish my book which I recently sent out to agents. I had a lot of positive feed back on it, but feel it may now need to be altered to suit a different age group. So for now, my writing has been put hold until September when I will have more time to focus on a future projects as well as the present one. Karen Conner - formerly of The Slowest Bookworm blog. Congratulations Karen. An email will be on its way to you today. published Angel Dust through Hot Key Books as one of its launch titles. The competition closes at 5pm on the 31st of August. 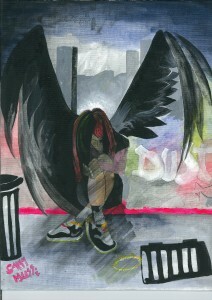 The winner will receive Sarah Mussi's fabulous painting and a signed copy of Angel Dust. Five runners up will also win a signed copy of Angel Dust. An astonishing fantasy debut from an 18-year-old classical musician has been acquired by Nick Lake at HarperCollins. Rights for the UK and Commonwealth were secured from HarperCollins US (Greenwillow Books) for two titles by author Stefan Bachmann, an American teenager studying music at the Zürich Conservatory in Switzerland, who began writing The Peculiar at just 16 years old. they cannot escape their pasts. That's all the news for now. Check back soon for more book gossip. Congratulations on finishing your manuscript! Good luck with it! Spending time with the kids comes first, no need to mention the lack of commenting. I can totally relate. Congrats on finishing your book!!! Good luck Viv, that is awesome. Hoping to hear more news on your book in the near future. Thanks guys for all your support. You are amazing. Thank you for doing this meme, Vivienne! Congrats to your book winner, Karen, and also to you, for getting your book out there. I can't wait to read it in the future!